Double session at Honolua for me yesterday. These are the photos I took after the first one (that was great). My camera was malfunctioning and that means I might need a new one. I have one to test today, I'll report the result of the test. Blog reader Cathy was there because she knows how to read the buoys. She also know how to take off steep. 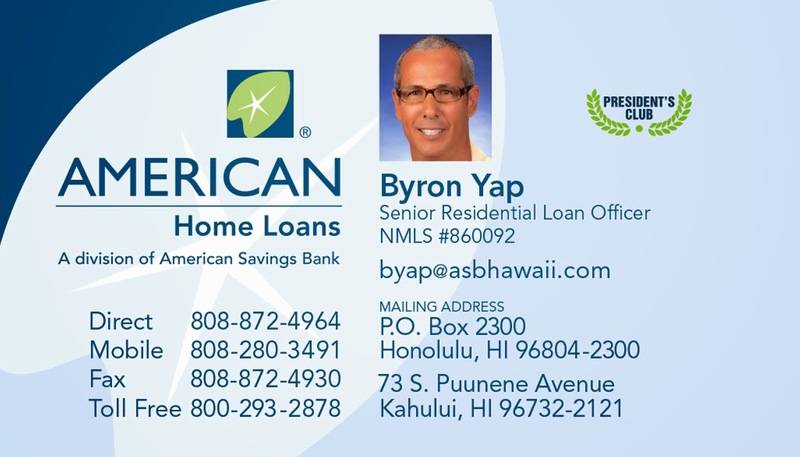 My friend Jason knows how to read the buoys too and he also knows how to fix credit scores. He's been doing that for years and it sounded very competent in a business phone call I got to listen to. If the customer on the other line would have known that he was sitting on a beach chair, checking the waves after a surf session at Honolua, he would have probably had some kind of negative judgment. If I was the customer instead, I would have thought: "if this guy organized his business so that he can do it from the road, he's smart. I'll trust him". 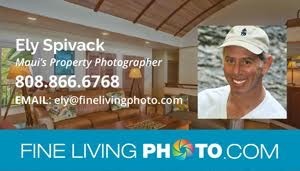 Here's his website. ..and then charged this steep section. As reported in the double beach report, there were some eights out there. My second session was poor: more people and less waves. I only got one. Here's a lucky shot, pulling back because someone else was already on the wave. 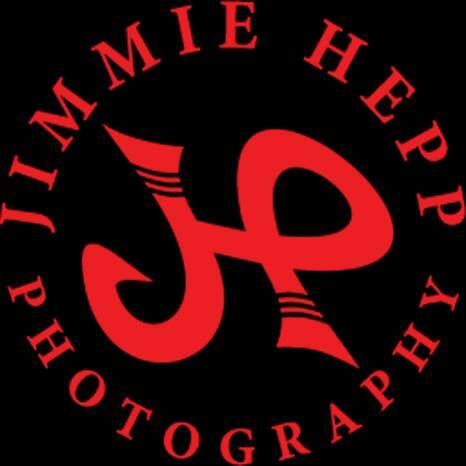 Meanwhile, at Hookipa Jimmie Hepp was shooting surfers and windsurfers and put the result of his work in this gallery. I called for excellent surfing and this is the very reliable report from my coworker Russ: "Sailing was really good. Borderline epic! Light side off logo and peeling." Of course, it takes some skill to enjoy difficult conditions, so it might have not been the same for every sailor. 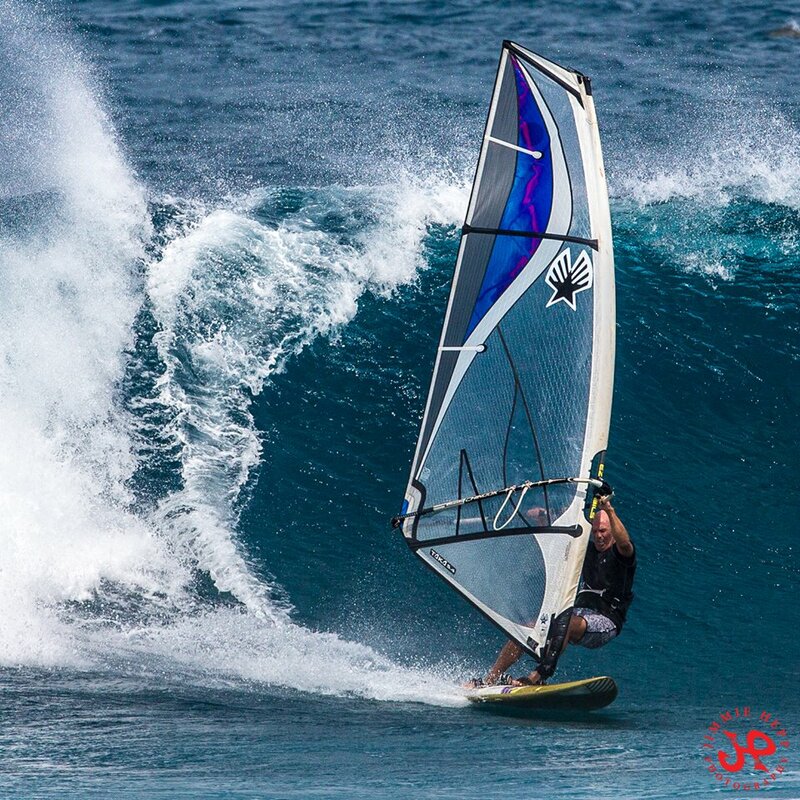 This is Tom Garcia on a wave that the windsurfers smartly call logo high. 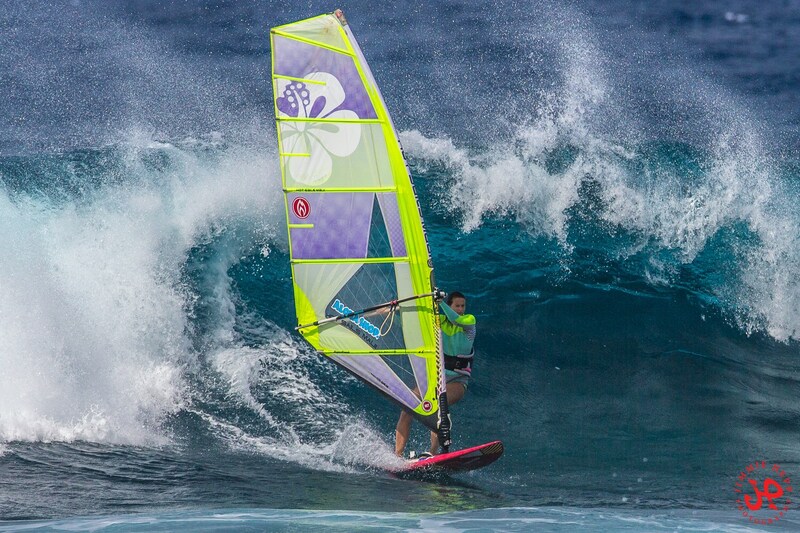 Using body or sail parts is a non confusing way of calling the size of the waves. Unlike the ridiculous and unscientific so called "Hawaiian scale". Nothing at the buoy, check the webcams. Below is the graph of NW101 and Pauwela. The NW swell first became north and now is NE at the first one (notice the dark blue direction line). In Maui the direction is still N (light blue) and the windswell is on its way up (dark blue). 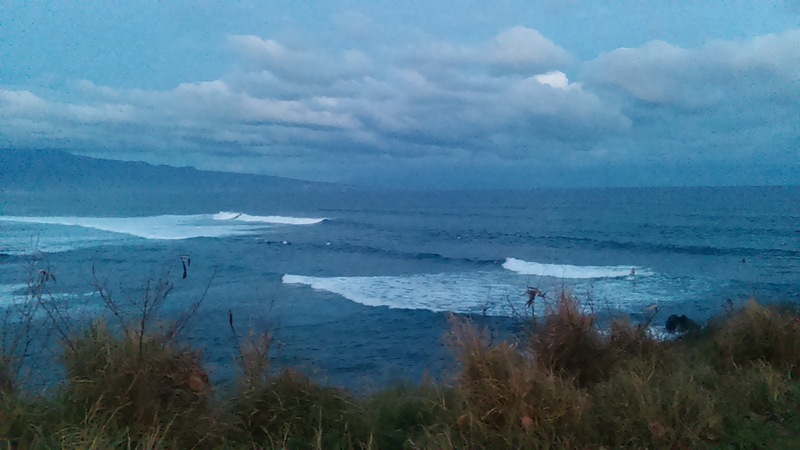 There will still be waves at Hookipa, at least head high is my guess, declining throughout the day. 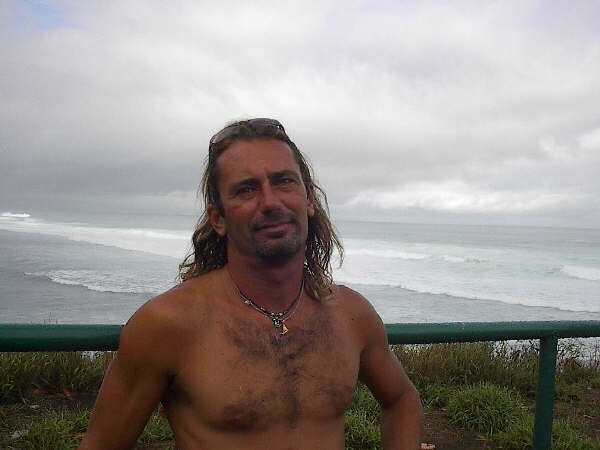 I won't be able to post a beach report, as I'm leaving at 5.30 to help a surf guide customer score a good session. I should be able to do a beach report from where we end up surfing around 9. For some reason, iWindsurf won't show the Hookipa sensor this morning, but there is some wind at my window. This is the NAM3km map at 1pm. Windsurfing will be sketchy today, probably only in the early morning (the maps look better than this one), before the rain hits. Check the MC2km maps when updated for a more reliable prediction. Photo satellite at 4.30am shows we're back in the clouds (we never really were out of them, as I wrongly called yesterday). That heavy rain south of us should move north and hit us in the afternoon. That is what the rain forecast on the HRW model on Windguru shows (red circle). PS. No time to review this post. Sorry about eventual spelling/grammar mistakes. 10am I confirm the size at honolua, but the consistency is kinda low. Maybe it will improve with the tide. 20 at the cave, 10 at the point. Overall, it's a 6.5, but when the set comes, it can be an 8. 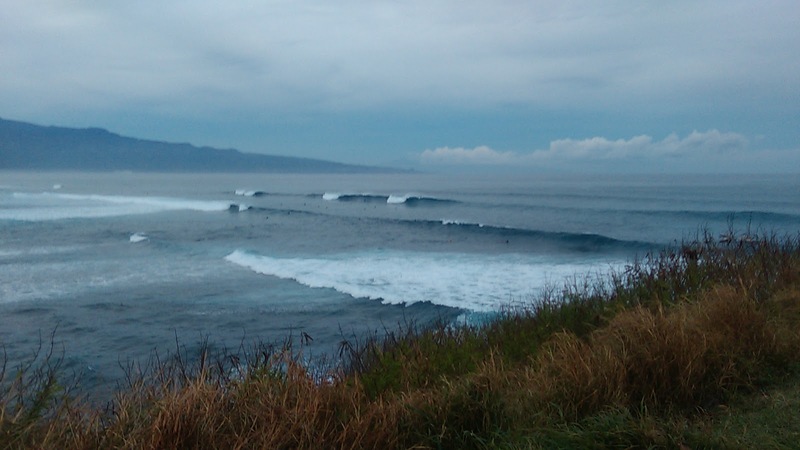 7am honolua has head to head and a half waves at the cave. Smaller at the point, as usual. I'll post another report after my session. Haven't looked long enough to score it. Just one session for me yesterday, but an excellent one in the early morning clean conditions. This is how Hookipa looked at sunset, the MC2km updated maps called the wind staying up till late correctly. As predicted in yesterday's call, the waves were bigger than at dawn. Still some wrap, check the webcams. The NW swell had a bump at the NW buoys that arrived also locally, as the graph of the three reported buoys shows below. It should be pretty stead throughout the day, maybe with a slight decrease at sunset. Seen the moderate easterly trades and the favorable direction (341 at Pauwela), I'm going to the bay early, stay tuned for a beach report. 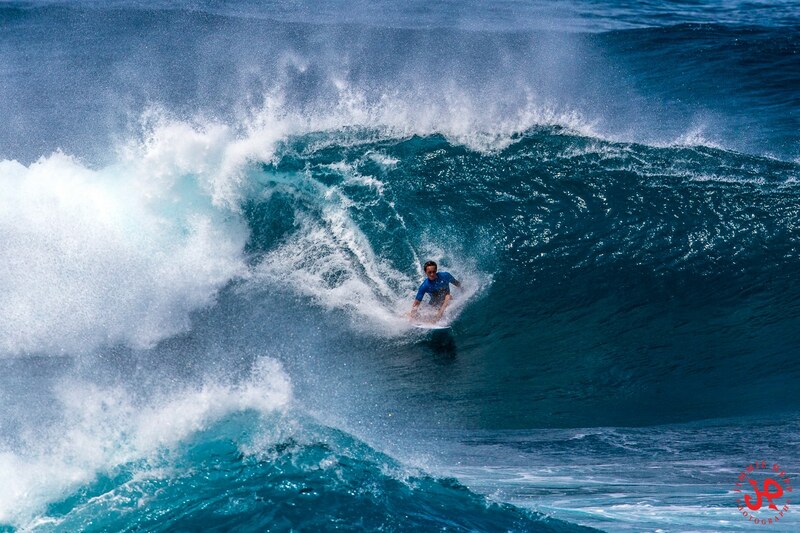 My guess for the size of Hookipa is head and a half to occasionally double. We are definitely out of the clouds. Satellite photo at 4am. I think I'm going to stop posting the 7am map from the NAM3km mpdel, and just post the iWindsurf sensor reading at the time of the call. This morning at 5am Hookipa is showing 11mph (6-17) from 107, which is sideoff. Below is the map at 2pm, that shows excellent windsurfing conditions. Please check the MC2km maps when they update them for confirmation. 2) moderated NE fetch. Related swell (the one from yesterday's fetches) already here (2.7ft @ 11s from 7°) and forecasted to turn more NNE (4f 10s from 29 tomorrow). 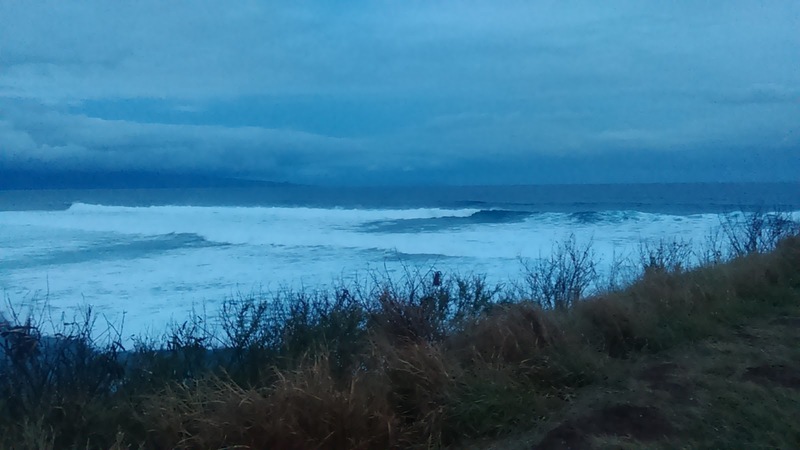 7am hookipa has clean head to head and a half waves. Consistency is low because of the still westerly direction. This one from the water shows the fun, playful size of the waves. Couple of (hundred) words to commentate my choice of going to the Bay. At that time in the morning, the swell was peaking at Pauwela with readings around 5f 15s from around 325. That's the direction after the swell refracted upon the upstream islands of Kauai, Oahu and Molokai. The original direction up at the NW buoys was around 305. As indicated in the NW buoy to Maui travelling time and shadowing angles (check the "labels" section for future references) the Molokai shadow line for Honolua is 335. But the longer the period, the more the waves have the ability of wrapping around land points. ALSO, here's a sentence from Pat Caldwell's meteo poem composed on Friday, referred to yesterday's swell: PEAKING SATURDAY FROM 300-320 DEGREES. Now, even though the dominant direction was shown by the NW buoys as around 305, knowing that the direction range was up to 320 was a good info to have. 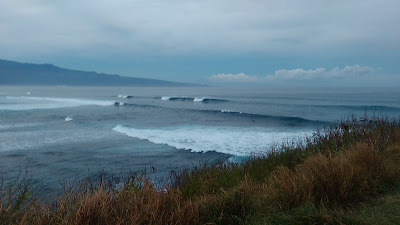 The consistency was low, because only the bigger, less westerly sets managed to wrap around Molokai, but some sure did. So, with those information in mind, I just judged the swell big enough to get in there and we definitely scored much cleaner conditions that what the north shore (that I surfed very early) was offering. Local knowledge paid off, no forecast on the internet will ever tell you exactly the size of the waves at Honolua in a case like this. You got to make your own call and that's what this website tries to help with. Bit of a wrap, check the webcams. 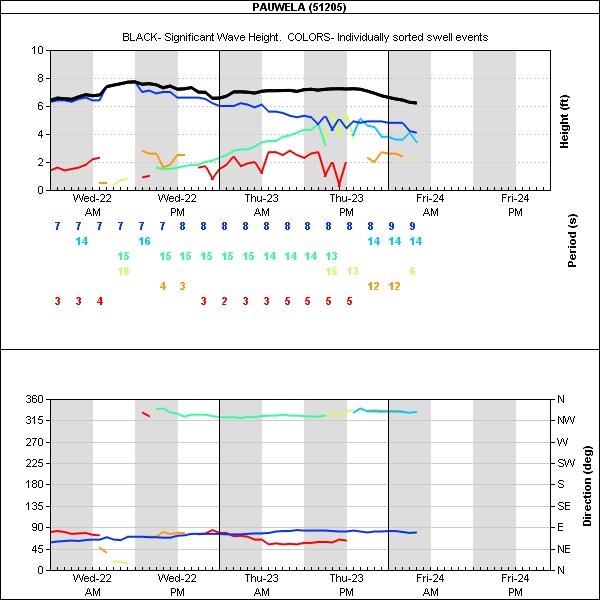 Below is the graph of NW101 and Pauwela and it shows that Pauwela has peaked yesterday late morning (red arrow), but the NW101 is staying pretty steady in size and the swell turned more north in the last 12 hours. The two things should compensate each other and the swell in Maui should be smaller than yesterday (3.5ft @ 14s), but stay pretty steady throughout the day. It should actually be a bit more consistent at sunset (and possibly even a bit bigger), because of the more favorable direction. NAM3km map at 7am shows ideal wind for surfing. The 2pm map shows ESE trades that should offer good conditions also in the afternoon. Check the MC2km map later when and if they updated them. Despite the fact that yesterday they predicted a late afternoon glass off that didn't happen, I still consider them the best wind prediction for Maui with a reliability of about 85-90%. Morning maps are more reliable than afternoon maps, because the thermals are hard to predict. Specially in a day like today, I add. 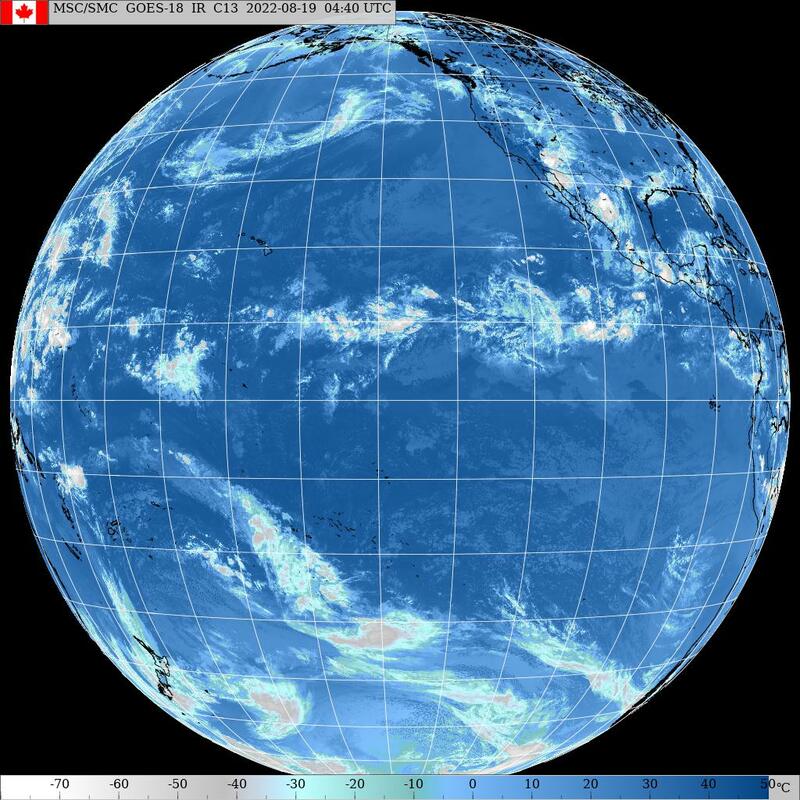 This is a satellite picture at 6am and shows that wide band of high clouds that is moving to the NE and has already cleared Kauai. From the animation (link n.6 of Gp's meteo websites list), it seems that the same will happen to Oahu soon and eventually also Maui. No idea what time, that's something I don't have much interest in. 2) elongated NNE fetch that will generated a swell predicted by Surfline to be 5f 11s from 24 on Monday afternoon. 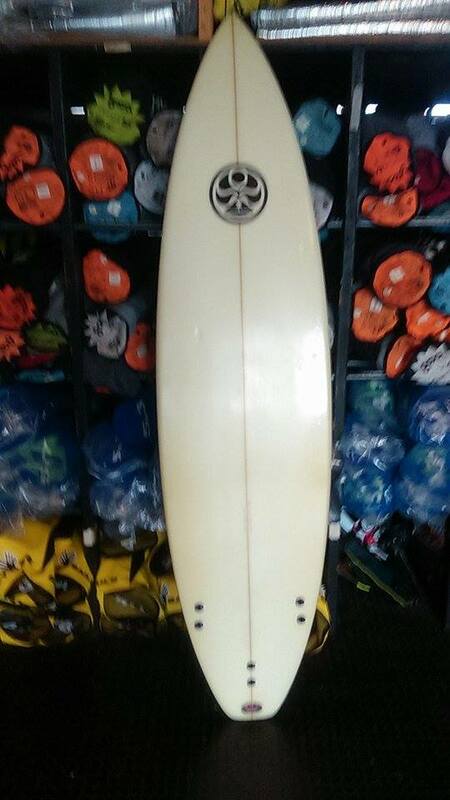 I got another board for sale. 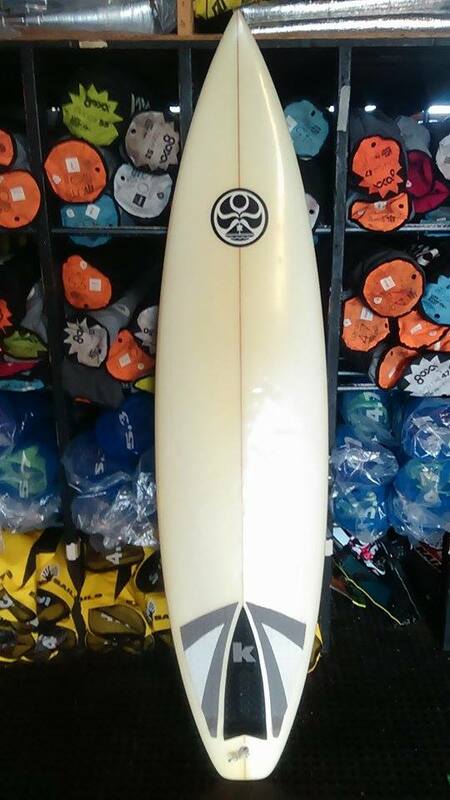 As I mentioned in a post more than a month ago, I ordered a slightly bigger version of my favorite board from the Oahu shaper Glenn Pang. 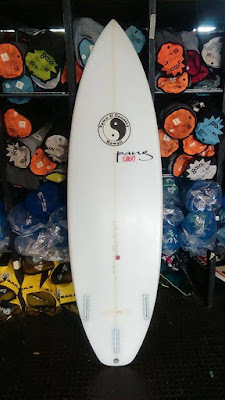 The new board is 6.0x19.5x2.5 30.8L. 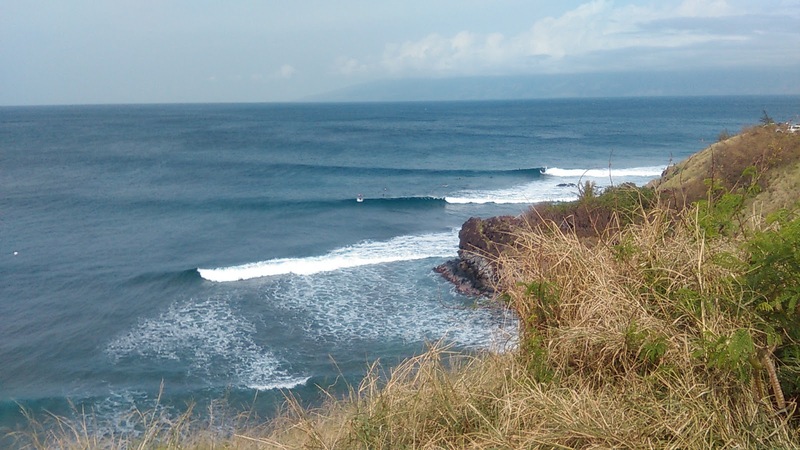 I thought a couple of more liters would help catching waves in the chop infested Hookipa waters. And they sure do, but once on the wave I'd rather have my thinner (2 3/8) old one, because I can put it on the rail easier with my light weight (I'm 142 pounds at the moment). More volume also helps when the waves are small/soft, but I have another favorite board for small waves. Plus I surf every day and my paddling should be able to handle the 28.5L of the old board. Here they are next to each other, no need to specify which one is the old one and which one is the new one. Both boards absolutely rip, I just don't need (nor have room for) both. In a month of use, I put a few pressure bumps on the deck and the price is $350 for a board that retails around $670. 10.30am honolua is a bit slow, but beautiful when the set comes. Head to a little overhead at the cave. 7 guys at the point, 13 at the cave. 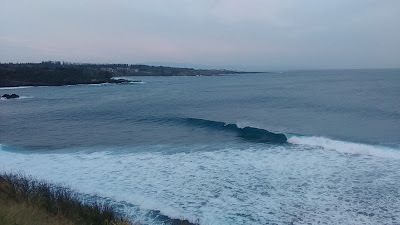 6.30am hookipa has head and half to doh sets from the new swell, but not particularly consistent. Very light wind, but the morning sickness makes the shape average. Might get better later, but also bigger. 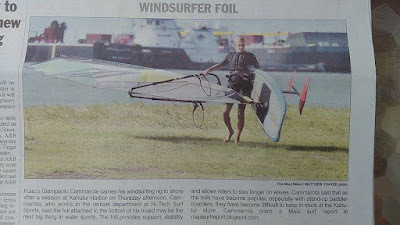 Below is the picture of me carrying my windsurf foil setup two days ago, that was published yesterday on the front page of the Maui News (click on it to read the text). 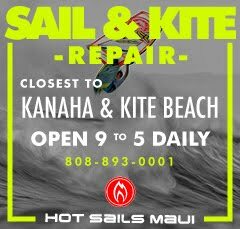 Thanks a lot to reporter Matt for mentioning the blog address and I feel like apologizing with my sail sponsor Hot Sails Maui for not having one of their sails. 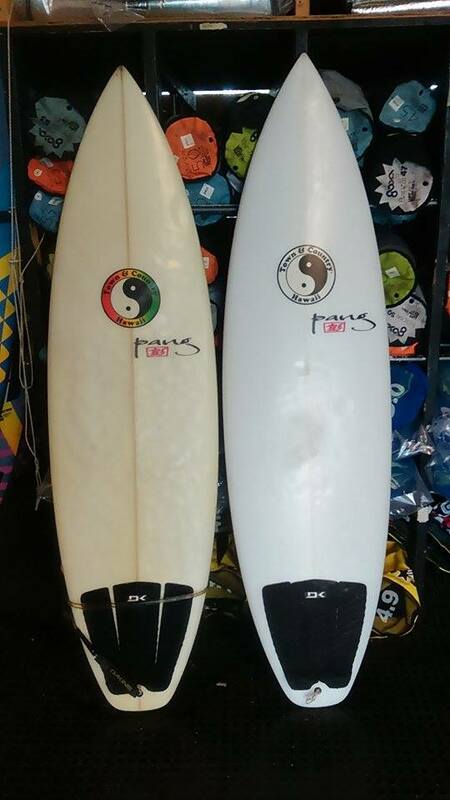 My weird quiver only consists of a 4.3 and a 4.0 and I needed a 5.8, so I grabbed one from the shop. And when you go for a solitary session at the harbor, the last thing you expect is to end up on the cover of the main Maui newspaper... in fact, I didn't see a single human soul until that shot was taken! Yesterday I surfed and windsurfed in the morning, but the waves at Hookipa were all crossed up. Here's a beautiful Hot Sails Maui sail in a photo by Jimmie Hepp from this gallery. Pretty much wrap only at Lanai, check the webcams. New swell went up at the NW buoys and now the direction is much more reliable. That is a direction that is shadowed, so Maui will get a bit less energy than Oahu. 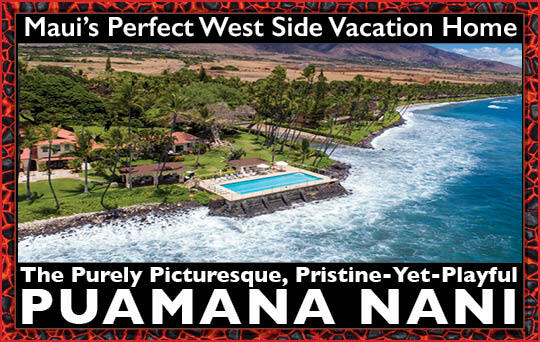 Below are the graphs of NW101, Waimea and Pauwela. I drew a blue dotted line for the last one, following the prediction of the WW3 model that sees the swell peaking in Maui at around 5f 16s in the late morning/early afternoon. As you can see from the readings, there's also the leftover from the previous NW swell (down to 10s) and the windswell. And in the meantime, the swell at Pauwela went up to 4.3ft @ 16s from 326° (NW) at 5am, so it's coming up nicely. That's well overhead at Hookipa, but stay tuned for the beach report for confirmation. The 2pm map shows stronger wind, but not enough for sailing. Check the MC2km map when available for a more reliable forecast. 1-2) two small but close fetches that will provide some northerly short period waves next week. 3) a moderate fetch down south that hopefully will take the flatness away from the south shores, but not by much. This is a satellite photo at 5am. It shows a layer of clouds coming in from the south. This is just a curiosity. A massive storm is predicted to form in the Atlantic and provide Nazare in Portugal with some really big waves. I expect pictures of that sessions to flood the internet. This is a board I'm selling for $200. 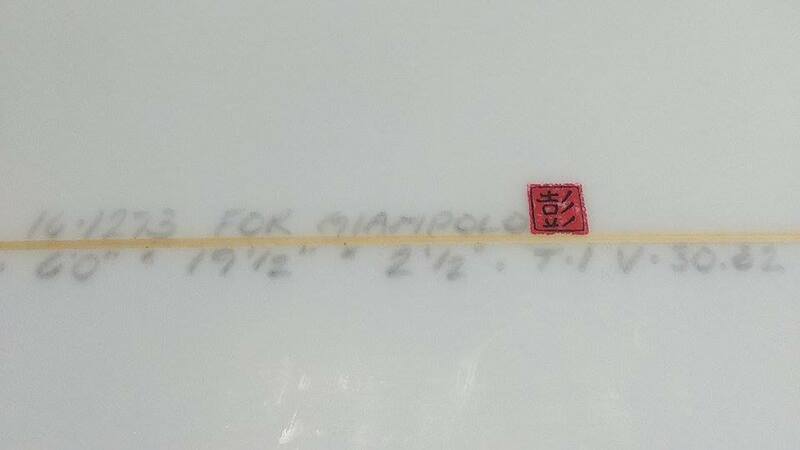 It's an Arakawa 6.6x18 3/4x2 1/2 and I just don't use it much, but it's a great board in good conditions. 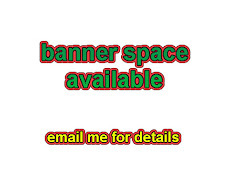 Here's the Craigslist ad. 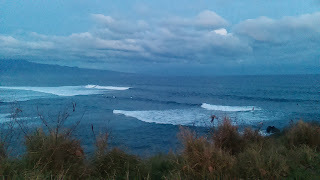 6.30am hookipa has head to head and third nw waves. It looks better than yesterday as there's no wind and less chop. 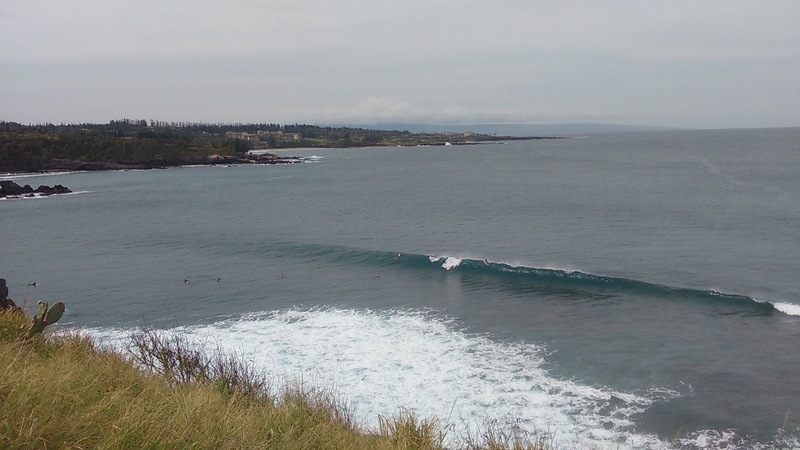 Yesterday the waves at Hookipa had a seriously bad shape. In the morning I called it a 3 from the cliff, but when I surfed it, it felt more like a 1.5. Things improved a bit at sunset, but not by much. Check how irregular is the lip line of this left. I took this photo from the car since it wasn't even worth getting out for a photo shoot, let alone surfing it. Well, that's also because I had just had some windsurfing foiling action earlier in the harbor. This time it went even better than Sunday and that's because the wind was much more manageable. Below are the graphs of the iWindsurf "Kanaha" sensor for both days. They should really call it "Harbor east pier", 'cause that's where it is. I only had like 40 minutes before the wind (as predicted by the MC2km maps) got just a tad too light. This time I had a 5.8 sail and I could pump the foil up on a plane pretty much anytime I wanted. Once lifted, I managed to stay up there for a maximum of 5-6 seconds before the thing inevitably did a controlled mini-willie and stopped. Too much weight on the back foot as blog reader Garrett suggested in a comment after Sunday's post, I need to learn to keep the foil leveled once up. But the most important thing is that now I know the kind of conditions that are best for learning and I only had a couple of non dangerous falls. I'm still convinced that this is the best way of learning. Yesterday's wind graph. Could have used a couple of more mph's. Just for (my) reference, this is the graph of Sunday when instead I had a 4.0 and it was quite a bit more challenging. Obviously. The first reading is the wrap of the current NW swell and the last might the one of the new rising one. In the end, you still need to check the webcams. Barbers buoy is down, btw. Reading the buoys sometimes requires some serious interpretation/knowledge. Normally I clean up those readings and leave only the "significant" ones for you guys, but this time I need them all for explanation purposes. Don't forget that those two buoys are sitting very close to each other. The 12-13s readings are the current NW swell that is now on its way down. 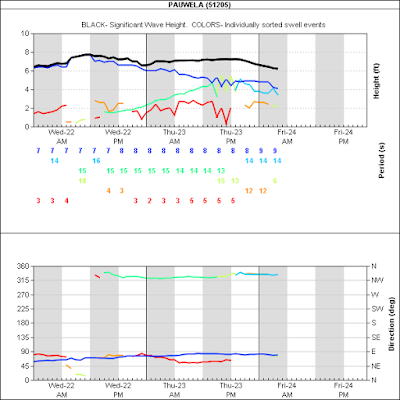 The sub 8s easterly readings are windswells. 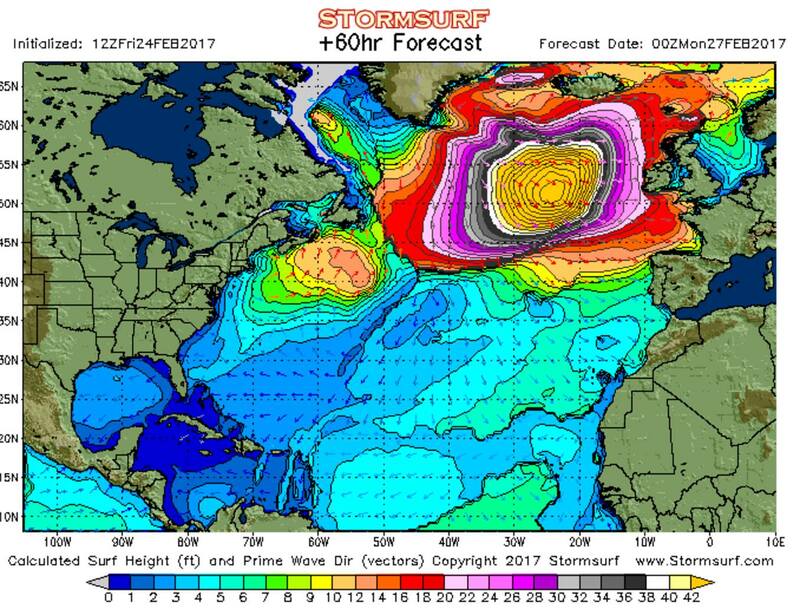 The 17-18s readings are the start of a new swell. The reason for those unmatching directions is that the buoys are subject to other energies and oscillations and the detection of the correct direction will only happen when this swell will grow in size and be predominant. I'm gonna push this concept even further and declare that, based on my years of observations, ALL of those directions are not 100% correct (whatever 'correct' means, considering that the wave trains of a swell always has a range of directions, not only one), since they all influence each other. Only if there's a single swell in the water, the direction indication becomes more reliable. None of the NW exposed local buoys shows signs of the new swell yet. But by applying GP's rule of thumb for the travelling time in its last and final version (I swear I'm not gonna change it again.. I might have to chisel it out on a rock at Hookipa...) 16h at 16s plus/minus 1's for different periods, those 2f 18s at the NW001 buoy should reach Maui at 4am + 14h = 6pm. Keeping in mind that that 2f at the NW buoy will be less locally because of the decay due to the travelling and to possible refractions, and that the period slightly increases with the travelling, the WW3 output is quite in line with that, as it proposes 1.5f 20s at that time instead. In other words, there should be some energy from the new swell at sunset overlapping to the old one. Old one that is on its way down instead, as the Pauwela graph below shows. The light blue line seems to have peaked around sunset yesterday, but 3-4f 14s are still a fun size to play with. The quality of the waves will depend on the local wind and on the interaction with the windswell that is still up to 4f 9s unfortunately. NAM3km map at 7am shows some possibly nice conditions on the north shore. 1) today the wind should be around 15mph from a direction around 60 degrees. Not the best for windsurfing (ideal direction for the north shore is around 75), definitely not the best for surfing either. 2) A wonderful (from the surfer's point of view, of course) start of the month of March. 4) I see it, I circle it. But I would not expect much out of this southerly fetch, seen how light the wind in it is.